New York in the 1960â€™s. A new wave of Chinese immigrants is moving into Chinatown. The adoption of the new immigration act has launched the district in a demographic boom! It now reaches Canal Street to the north and Bowery Street to the east. The immigrants, hard-working men and women, are arriving by the thousands to buy buildings, establish businesses and fulfill the American Dream! In this game, you are one of them. With all your savings in hand, the Big Apple is up for grabs! Will you know how to use your talents and acquire the most extraordinary fortune in America? The board represents the New York Chinatown of the mid-60â€™s. It is divided into 6 districts containing buildings numbered from 1 to 85. A game is played over 6 rounds. In each round, the players receive income from the businesses they have managed to establish. To generate the maximum income, shops of the same type need to be built on adjacent buildings. At the beginning of each round, players draw new Building cards and new Shop tiles. They must then use their negotiation skills to acquire adjacent buildings and establish businesses. But it is not always that easyâ€¦ In this game where everything can be negotiated, only the hard laws of the market prevail. If you like making trades and deal then have I got a deal for you! Chinatown! Z-Man Games has done it again, an out of print classic brought back to life. Set collection combined with tile placement with a healthy dose of deal making means a fun time for everyone. Keep them coming Z-Man. Area control with a Chinatown theme. You get jewelry stores, tropical fish, cleaners, and take out! I like my games to be fast moving with as little downtime as possible, so I love simultanious action mechanisms. 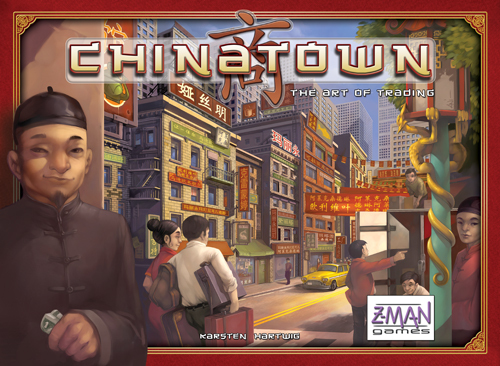 Chinatown employs a very simple but efficient mechanism, where all players negotiate with each other at the same time. It sounds chaotic, and it can be - but it is also great fun, and it pretty much eliminates downtime!